Scooby Doo – where are you???? You were silent in the face of evil. You were warned but you refused to speak out – you even made excuses! Ye reap what ye sow. In the name of Allah, the most merciful and the most gracious. Now’s a good time to stand back and remain silent. Because, you’re really good at that. They don’t realize how dumb they are. You have no right to threaten and harass people, be that in person or online, and you and your poor misunderstood jihadists never will. better get used to it. These are blatant threats. 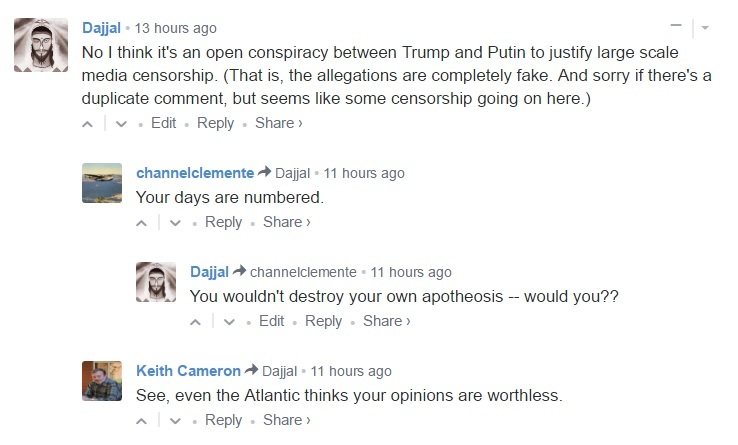 They were issued in the comments in the article Europe Under Siege on The Atlantic.